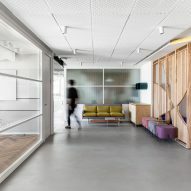 Curved partition walls and ceiling panels hint at the research underway inside this Tel Aviv office, which Roy David Architecture has designed for a tech company specialising in prenatal care. 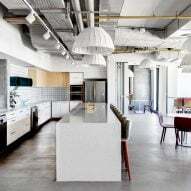 Occupying the 26th floor of Tel Aviv's Alon Towers skyscraper, the office has been designed to subtly reflect the "data-centric and feminine nature" of products made by maternal tech company Nuvo. Nuvo was established back in 2007 and is dedicated to the development of wearable pregnancy monitors that provide mothers-to-be with information about fetal activity in the womb. Locally based practice Roy David Architecture kept this in mind when arranging the 1,500 square-metre space, which also had to be versatile enough to accommodate the company's research and development departments. "The primary design challenge for Roy David Architecture was to create a space that not only spoke to the nature of the unique products that Nuvo develops, but also to provide a variety of working environments that would accommodate the unique and highly technical work done by the company," explained the practice. Upon entering the office, employees walk via a reception area that's anchored by a flecked stone desk counter. Seating is placed behind a boxed volume made up of panes of coloured glass and curved timber panels that are meant to loosely resemble the shape of a woman's body during pregnancy. Curvaceous forms appear again on the ceiling, which has been fitted with sweeping, brass-lined panelling, but is contrasted by angular carpeting that has been applied to the floor of following rooms. 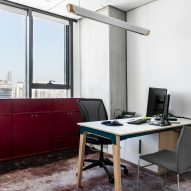 The studio has applied what it describes as "elegant and soft" hues throughout the rest of the office, which has been finished with a combination of private meeting rooms and open seating booths to suit different work styles. In the break room, stools with rosy-pink legs sit under a sage green kitchen island. 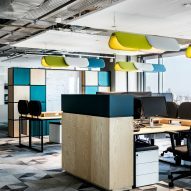 Light-hued ash wood has also been used to create high counters that run around the periphery of the room, where employees can work on laptops whilst taking in surrounding views. Timber has also been used to create freestanding partition walls with in-built whiteboards that offer separation between different teams of staff. 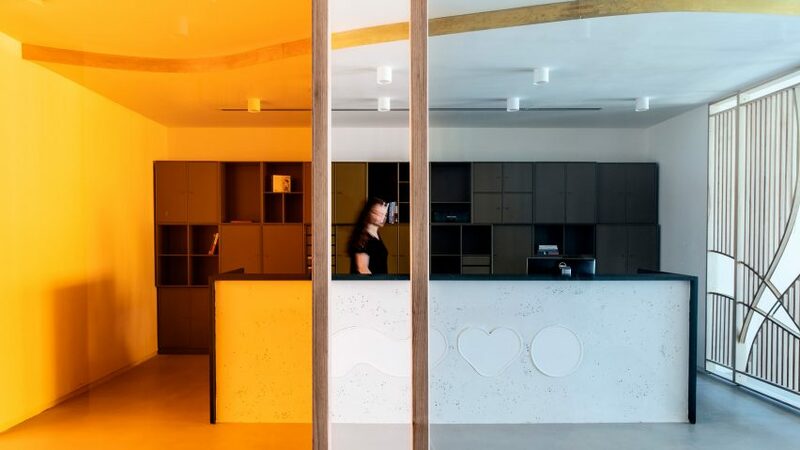 Designer Maayan Zusman and architect Amir Navon recently completed the interiors of a medical office in Tel Aviv, which is meant to look more like a minimal apartment – the space features white-painted walls, sheer curtains covering the patient rooms, and a jet-black seating niche.